Reggae fans and Rastafarians gather in Kingston during the first week of February each year to enjoy a feast of events lined up to commemorate the life and work of Jamaica's best-known son, Bob Marley. Marley was more than just a musician but a religious leader, activist and philosopher as well. Travels in Jamaica would not be complete without some investigation of this powerful national (and global) icon. Apart from a concert, the week includes symposiums, lectures, karaoke contests, a fashion show, exhibitions and various other events related to Marley. The week is organised by the Bob Marley Foundation in conjunction with the Bob Marley Museum. Apart from the museum in Kingston, which was Marley's adult home, the small museum in Nine Mile Village near Ocho Rios, where he was born, is also usually a booming centre at this time. For Bob Marley fans, and those interested in Rastafarianism, this is the perfect time to schedule a Jamaican holiday, and there are all sorts of fun spin-off deals and events to enjoy. 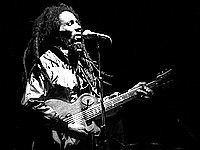 Marley was born on 6 February so the festival always coincides with his birthday.